There was a joke saying that ambiance in a well-done developed city is actually similar to living in a countryside, but with different affluence. It won’t be too sophisticated and high-tech like Tokyo, too commercialized like New York, as fashionable as Paris, vastly expanding like Shanghai, or having 24/7 hustle bustle economy like Hong Kong and Singapore. It will be far from crowded, less commercialized, less populous, less vibrant, slower pace of life, having lower density and low rise development, but relatively less pollutants. It is exactly like living in a village, the environment that might be kind of boring for the lively lifestyle of the young working-age population nowadays. So what kind of urban element that could represent the advance level of sustainable development in a city area? Please do not expect bling or flashy things. But one of the ultimate answers would be: city grazing, literally sheep grazing or goat grazing that is on a green pasture or landscape along a river bank in the middle of a city. 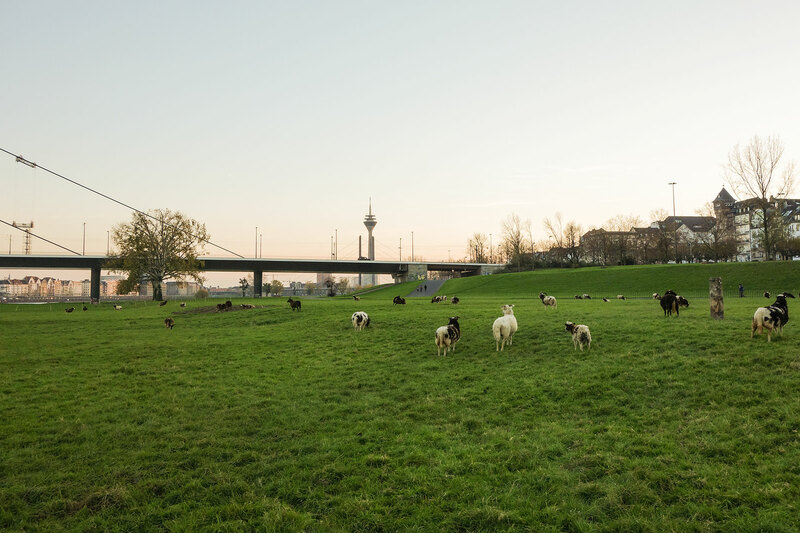 The picture above illustrate a mixed of goat and sheep grazing in Düsseldorf, the seventh largest city in Germany by population, yet one of the most affluent city in the Western part of Germany. The quirky thing is that this huge grazing area is located right in the heart of the city, precisely on the wealthier western side of the city. “Although domesticated farm animals are usually envisioned in rural areas, in the last several years, more and more cities in Europe and North America have begun to utilize goats and sheep to maintain public parks in urban areas, even in densely populated downtown areas.” (Museum of the City). Not only found in Düsseldorf, this method is also well applied in other big cities, such Paris and San Francisco. It is indeed quite unique to see a landscape of huge pastures, while having city skyline as a nearby background. This is like having two different opposite things that work well in the same place, and give more beneficial value added to each other. As a state of the art in sustainable lifestyle, city grazing functions as an environmentally friendly solution to weed control, where goats and sheep are rented to naturally clear public and private land. “Sheep or goat-grazing is an ecologically sound practice that eliminates the need for toxic herbicides, chemicals, and gas-powered lawn mowers. They clear brush in areas that people or machines cannot easily reach, like steep slopes or ditches. The goats can help restore soil fertility by providing organic fertilizer.” says City Grazing, a San Francisco-based goat landscaping business founded by David Gavrich. City grazing becomes an extreme alternative for clearing and maintaining urban landscape or parks, which is to replace the use of mechanical lawnmowers. This approach is considered cheaper and less noisy as well. Generally, idle open green spaces in the middle of prime area would be considered as a waste. In the end, extra green spaces will be sacrificed and turned into urban commercial zones, such new residential or shopping area with profit oriented directions. Gradually, driven by city’s extreme population growth and strong gentrification forces, functions of urban landscape are gradually vanishing and transformed into artificial built environment. This is very common in economic-driven cities, especially the ones that are lacking of social-spatial development control and awareness. According to materialistic evangelists, image of developed cities is supposed to be super high-tech, glamorous, massive and centralized infrastructures, well-off with superficial skyscrapers and flashy cars. On the other hand, some best practice models in the most developed and wealthy cities actually try to go back to a more natural and greener cityscape, which has a direction to reviving the essence of natural and wild life ambiance equipped with more independent urban services, resource efficiency, decentralized infrastructures, and clean technology. City grazing would clearly signify the opposite direction: the importance of non-commercial green area and natural methodologies in maintaining it. What is the mentality behind this simple way of thinking? Cities like that would need inhabitants that has a respect towards urban landscape. The urban setting is made to encourage the citizens (including the young ones) to care about the nature, to live close to the nature. As growing up, people tend to treat urban greenery as an active space, rather as a passive or void space. Open public plazas, car-free pedestrian areas, and blue-green spaces are so abundant in various sizes, even if they are located in the most prime and profitable area of the city. There is no overly-built shopping areas, commercial zones, or residential buildings. Every artificial built or natural environment is developed and managed according to the city needs. The private property growth is strictly managed under municipal control, but the public infrastructures such transportation, parks, and waterways are serving the citizens well and accessible for everyone, including the disables. The city landscape indicates the equal social justice. So whether in a higher density area, or lower density one, green infrastructure is always considered as a sacred city medium, where many people will use the urban open space as zones for social interaction, relaxing, sports, and leisure. Many people are willing to spend their time for hours in the outdoor park for socializing, having lunch, or just lying, reading and having picnic on the grass whenever the weather permits. City planning that supports these kinds of attitude will evoke other back-to-nature projects, as well as encourage the future community to adopt a more advance sustainable lifestyle towards self-sufficiency, such as swimming in natural swimming ponds rather in the conventional swimming pools, biking and walking rather than driving, or opting for bio and permacultural food products through urban farming instead of mass-production processed food. The society is mostly exposed to cutting edge knowledge, research, and technology that make their urban life easier and energy efficient, but on the other hand highly appreciate healthy eating, regular outdoor sports, and sustainable living value. This kind of paradigm at the moment probably is still only native to and deeply-rooted in most developed European and North American cities. To introduce, or even to replicate this model in another city with different environmental setting and anthropological culture might take a lot of efforts and time. But the spirit can be assimilated sporadically in everywhere, in order to create other urban landscape models that are adaptive to each city. So, if you find sporadic city grazing at the corner of your city most precious area, in the middle of high density urban development, you should be proud. It is not a waste of space. It might be the embryo of sustainable living.